For most, the idea of a second hand jumper would conjure up images of snot lined sleeves, bobbled underarms and shrunken hemlines. I will admit, until a few months ago, I would have agreed, believing it better to buy knitwear knew. That was until I purchased a house and became the proud* (*see poor) owner of a mortgage and my life of being eternally skint really began. Buying clothes at boot sales has always been a bit of a taboo subject. In the dark, damp light of 7am, it’s sometimes impossible to see what you’re getting. I’ve bought stained, ripped and damaged clothing, all because it was barely light. But for 50p and £1 a pop, it can be worth the gamble. Most of the time, the things I have purchased have always been in good or excellent condition. With a quick wash and iron, they’ve been ready for eBay (more about that another time). Sometimes, just sometimes, I do keep some for myself. So, quite recently, I was fortunate to stumble onto these three jumpers at a local car boot sale. I’ll be honest, I kept all three! The dove jumper did have some minor bobbling and has been incorporated into my ‘no heating until Christmas’ pajama wardrobe. The squirrel jumper is in immaculate condition and is freshly laundered awaiting Christmas and bright tights. 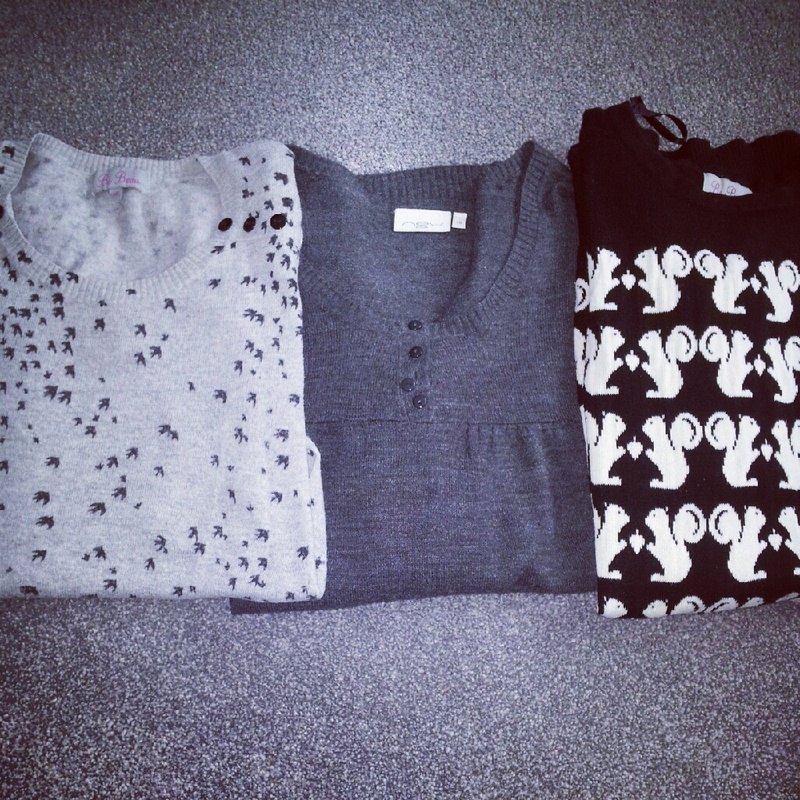 Which left my least favourite (now favourite) of the three, the charcoal grey round neck jumper. At the time of purchase, I was on a prints ban, a self-induced prints ban. Everything in my wardrobe had a pattern, be it skulls, floral, animals, hearts, polka dot or stripes, nothing was plain. This made mixing clothes, and making full use of them, a perpetual nightmare. It was clear that I needed to invest in plain basics, problem was, I’ve never been a fan of patternless clothing. Although, I should admit here, that I *adore* basics with a twist. As much as I disliked the grey jumper, I couldn’t release it to the charity bag just yet. So what if the seam had come loose and a button was hanging off? It was nothing that a novice stitcher like me couldn’t fix. For weeks, the jumper sat in my laundry basket awaiting its fate, until one night, browsing eBay, I discovered red, felt hearts. 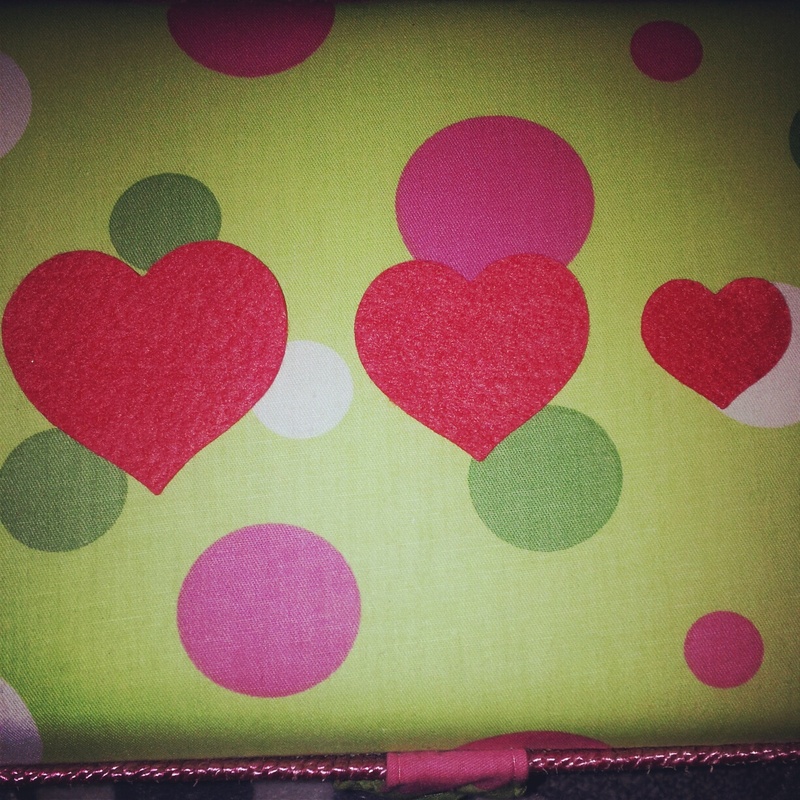 I am a huge fan of heart prints, heart shaped objects and, generally, hearts that beat! The seller was offering 12 red felt hearts in an assortment of sizes for a meagre £2.50 (including post and packaging). A few days later, through my letter box they popped and sparked my enthusiasm. Of course, it became obvious, a few hearts added to a plain jumper would add instant cuteness and avoid being a plain Jane. 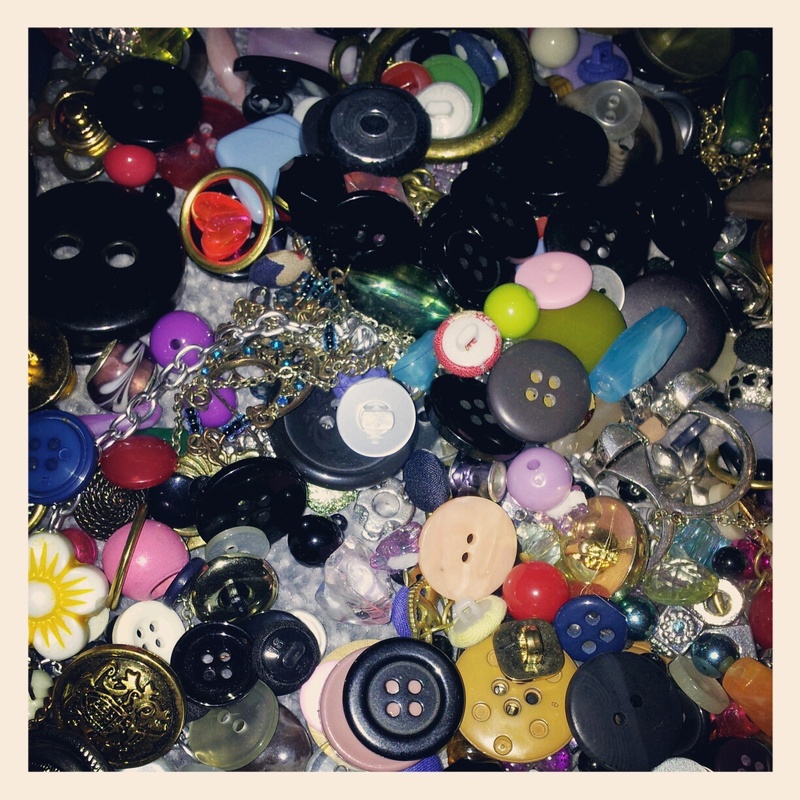 Now, everyone has a collection of buttons they’ve salvaged from old clothing and boot sales, and are saving for a certain project. Just me? Didn’t think so. The jumper’s original buttons were charcoal grey, dull and lifeless. Trimming the loose button, I decided to have a rummage and found a number of buttons awaiting an exciting new life. 1. 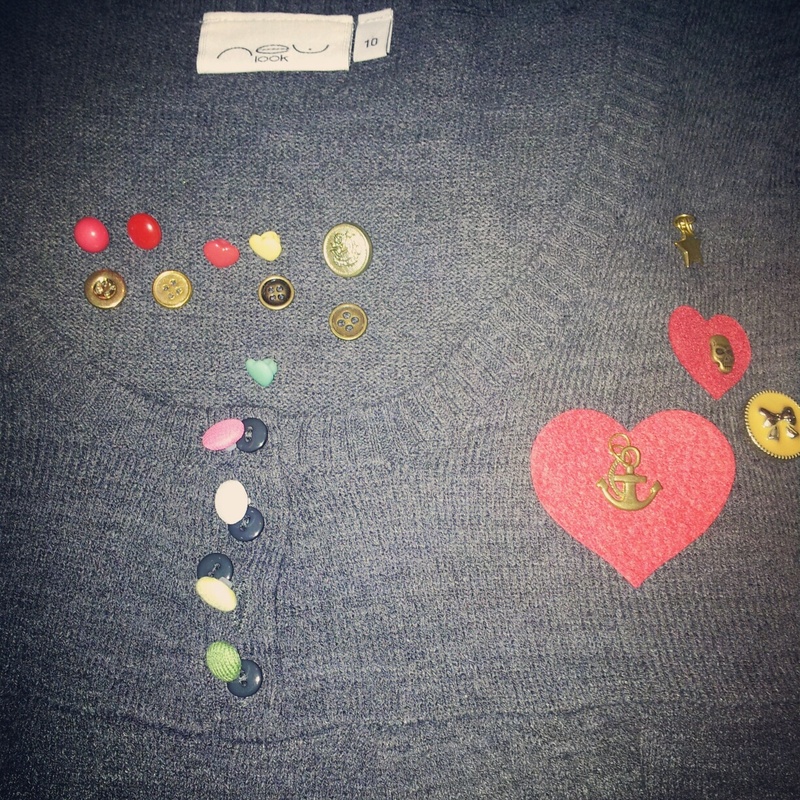 Lay out your jumper and place fabric hearts, buttons, charms where you think you would like them. Play around with layout. Take a photograph, just incase. 2. 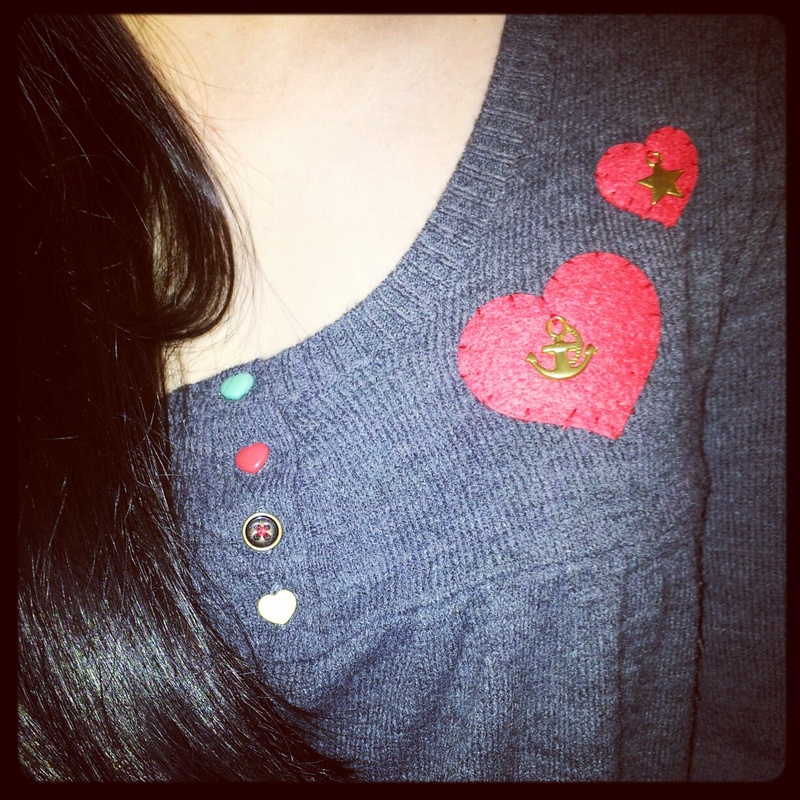 Stitch buttons on first, these can be fiddly to apply and you’ll want to avoid scrunching your felt hearts. 3. If you’re adding charms onto your heart, attach these first. 4. Place heart/s in desired place, use fusing web to iron in place and secure with small stitches same or contrasting colour. I’ve worn my new (to me) jumper once since making it fancy last night. I wore it with a Yumi Peter Pan collared mustard dress…there’s just something about charcoal grey mixed with mustard! I’m pretty pleased with the result. I plan to add studs to my eagle t shirt next, or maybe studded loafers? The possibilities are endless. What do you think? Is it better to buy knitwear new? Or is the lure of a 50p knit just too tempting? Have you had any clothing bargains at a boot sale? Charity shop?